Wim Wenders became a major film-maker when, in the 1970s, German cinema became cool around the world. His hits included The American Friend and Paris, Texas. But Wenders was privately experimenting with one of the most straightforward of visual technologies - the Polaroid stills camera. Thousands of those shots were thrown away - but now a selection of surviving images has gone on display in London. 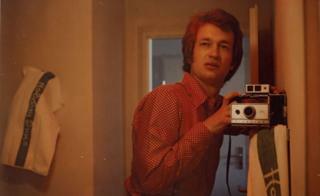 Wenders says when he started taking Polaroid pictures in the mid-1960s it had nothing to do with art. "It was just part of my life. I would photograph things to do with movies I was making, or when I travelled. It was useful and fun - which I think is what Polaroids were for most people." Instant photography - doing away with a separate and lengthy process of developing film outside the camera - arrived commercially in 1948. It was the creation of Polaroid's founder Edwin Land. In the early years the images were black and white. The big step forward was the arrival of the Polaroid sx-70 camera in the early 1970s. "It was science fiction and nobody had seen anything like it. You pointed the camera and took the picture and then it came out - an empty, blank bit of white paper. "And before your eyes it slowly turned into the image you had shot a few moments before. It was exhilarating in its colours and brightness. "You have to remember that at this time people didn't have even VHS tape - we were in a simpler, analogue world. So to be able to create and record a visual image almost immediately seemed extraordinary." Now some 200 of the images are on display in London, under the title Instant Stories. Some of them show well-known people the director worked with such as the actor Dennis Hopper. Others are landscapes or pictures of odd corners in places Wenders visited such as New York or Sydney. There are also close-up images of a TV set showing the 1956 film The Girl Can't Help It, with appearances from Eddie Cochrane and Gene Vincent. "It's still my favourite rock and roll movie. And suddenly with a Polaroid you could photograph something you enjoyed and you had it in front of you to hold, almost at once. At the time it was extraordinary. "The other great thing is that if friends were in the image you could give it to them - and that's what happened to many of the pictures I took. "I'd had traditional cameras since I was six or so and I enjoyed using them. But there was a whole new spontaneity with the Polaroid which I think some people are now starting to rediscover the way they've rediscovered music on vinyl. "But the kids will regret it when they're older: if you're 25 you have to realise that the phone which seems so great now will one day be yesterday's technology and lots of the digital images we all have will be hard or even impossible to look at." But doesn't a modern smartphone produce images far more sophisticated than any Polaroid camera did 40 years ago? Wenders says the basic character of the technology was part of the appeal. "I think people who look at the images will find a sort of beauty here. The colours the process produced are great, though the monochrome images are attractive too." The director points out a particular black and white picture. "It's the Hoboken Terminal in New York and I was shooting a film 30 years ago there called Lightning Over Water. These places are mainly gone." For a long time the pictures just went up on Wenders' refrigerator and then were stored away in cigar boxes. "But they remain unique: they only existed once and there's no negative and you can't duplicate it. Forty years later they seem quite precious." Wenders remembers that at the time a new Polaroid model or a big technical development was the equivalent of an Apple launch today. "So when the sx-70 came out we were delighted to get hold of it early to use in the film Alice in the Cities (1974)." The new show in London plays on a loop the scene from The American Friend in which, says Wenders, "Dennis Hopper invents the selfie with a Polaroid camera." There was also a use behind the camera. "So at this time there's no video playout and you only see your rushes three days later. The Polaroid camera can be a real help setting up a shot." But in the 1980s Wenders abandoned Polaroids entirely. "I was starting to take stills photography more seriously and I started to use large-size cameras". But he retained one of his old Polaroid cameras and only recently gave it to Patti Smith to replace one she was having problems with. Wenders thinks digital photography is now so problem-free and so cheap that a lot of the creativity has gone. "It's so easy for a professional photographer to take hundreds or even thousands of pictures of a particular face or of a scene and of course a few of them will be good and the rest are wiped. It can be an impersonal, industrial process. "The Polaroid was instant but it was still connected to the original idea of photography. There was always something sacred about the act of stealing an image from the world." Instant Stories: Wim Wenders' Polaroids is at the Photographers' Gallery in London until 11 February 2018.